I am going to admit something here that I probably should not. I find myself weirdly interested in those stupid Facebook quizzes that promise to tell you everything from which famous person you were in a previous life (Cleopatra) to what what your nickname should be (call me, Honeybear, by the way). Ok, some of them I can resist. I had no interest in taking the Rachel Dolezal Skin Test. But, the other day Gun and Garden had a test called, How Well Do You Know Southern BBQ? I assumed this one was a no brainer, so I dove right in. FYI, I was wrong! I made an embarrassing 70 on the test. In my defense, there were some highly regional questions! I had no idea about Oklahoma prime rib, what meat part is slow cooked at a barbacoa or what ingredients go in a South Carolina hash. If I am honest, it is a true miracle my score was as high as it was, considering I guessed at least 4 of the other questions. Thank goodness there was a question about smoked chicken with white sauce. I totally aced that one! No matter, I still know good barbecue. How could I not? I have grown up around delicious barbecue all my life. But back to the test. As I finished the test and got my pitiful score, I noticed another article called, The Barbecue Bucket List. I clicked on the link to find out which establishments made Gun and Garden's list. The list highlighted restaurants in the southern states of Alabama, Tennessee, Mississippi, Georgia, Kentucky, South Carolina, North Carolina, Arkansas, Louisiana, Texas, Virginia, Florida and even included Washington DC, Maryland and Oklahoma, which are borderline Southern, at best. As far as the Alabama picks were concerned, I have been to only 2 of the 4 listed. Saw's in Birmingham and Big Bob Gibson in Decatur. 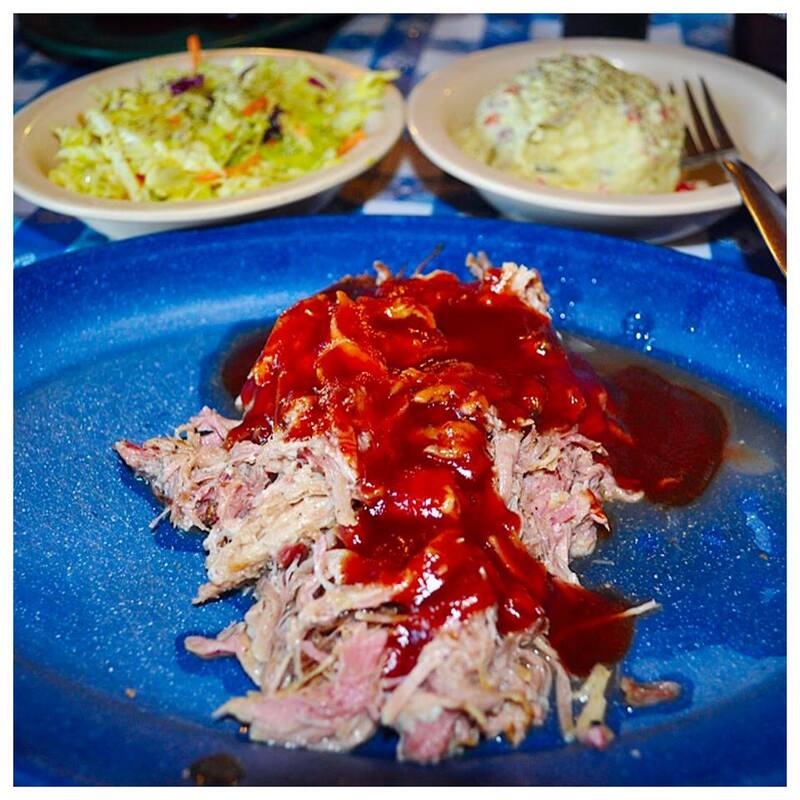 I am adding Archibald's in Northport and Miss Myra's Pit Bar-B-Q in Vestavia Hills to my must visit list. As far as the other states go, in my defense, I do not go to Louisiana or Florida for the barbecue. If I am in Louisiana, I am eating Cajun and Creole cuisine and if I am in Florida, it is seafood all the way. Actually, if I stop to think about it, we have such great barbecue in Alabama, I find little reason to go somewhere else for my barbecue fix. 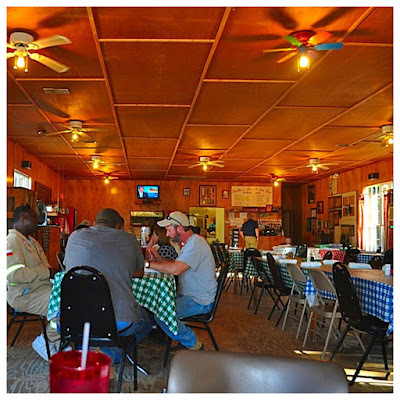 But just because I am nosy, I looked down the list of remaining states.When I came to Mississippi I noticed 3 restaurants, Abe's Bar-B-Q in Clarksdale, Lamar Lounge in Oxford and Leatha's Bar-B-Q Inn in Hattiesburg. There was something about that list that rang a bell. Then I remembered...JD and I had visited Leatha's last summer! The rest of the summer had been so busy, I had come home and forgotten all about Leatha's! JD and I were returning from a trip to Houston and were traveling through Hattiesburg on our way back to Scottsboro. It was getting close to dinner time and we had no idea where to eat. 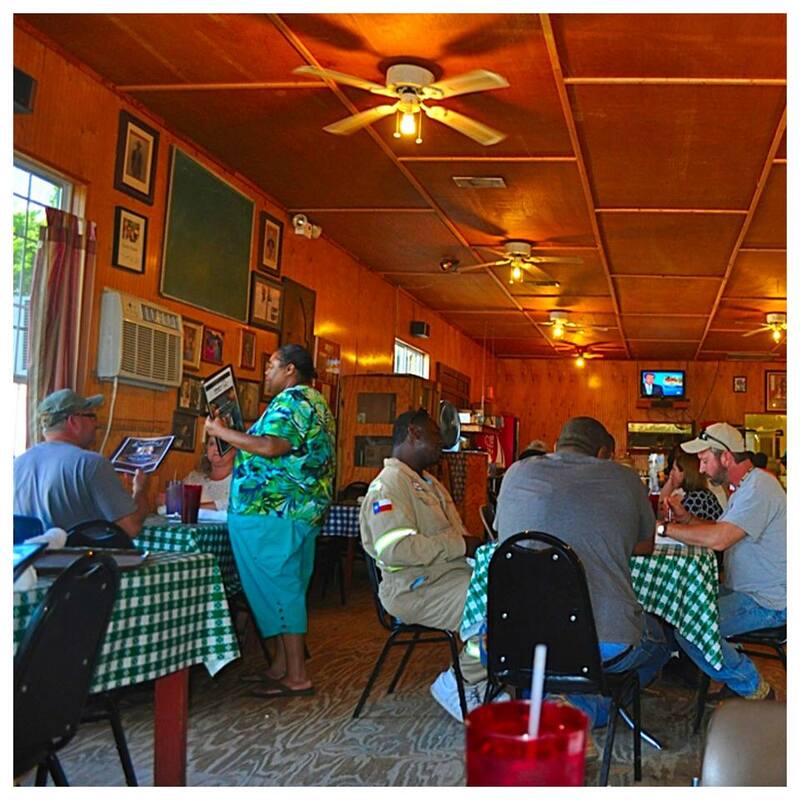 I pulled up my Around Me app on my phone and the app indicated that Leatha's Bar-b-que Inn was very close by. It was right on US 98 about 2 minutes from where we were. We decided to give Leatha's a shot and headed that way. We noticed a gray looking shack sitting by itself in the middle of a gravel lot. The shack turned out to be Leatha's. Honestly, I was a little unsure as we pulled into the parking lot, but we were tired and hungry, so we went on in. 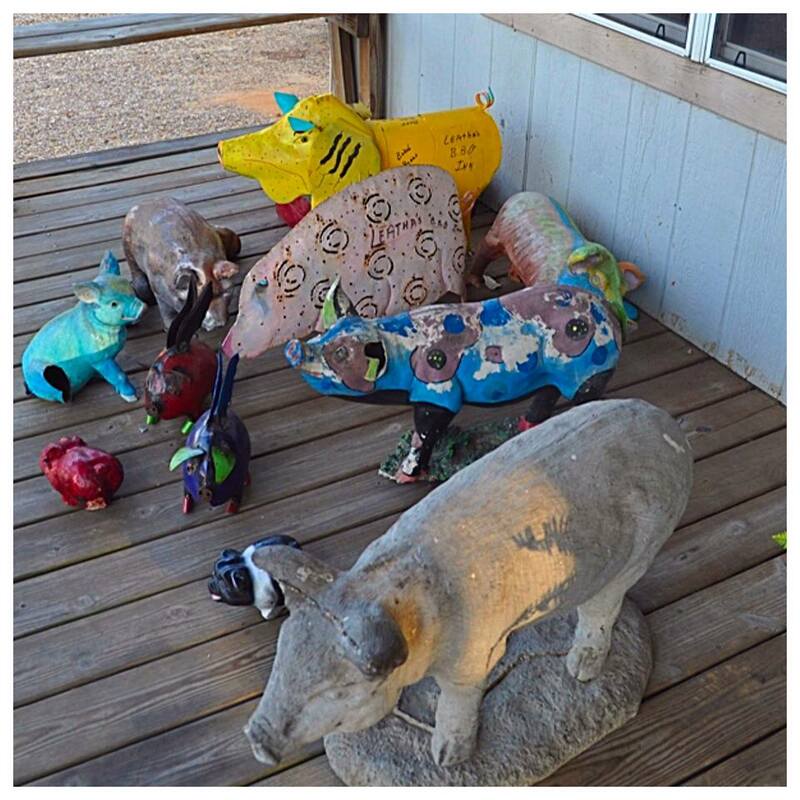 The first indication that Leatha's might be taking eating pork seriously was on the front porch. Pigs were everywhere! The second we noticed as we walked in. There were wash cloth napkins on the tables. My first thought? This is going to get messy! 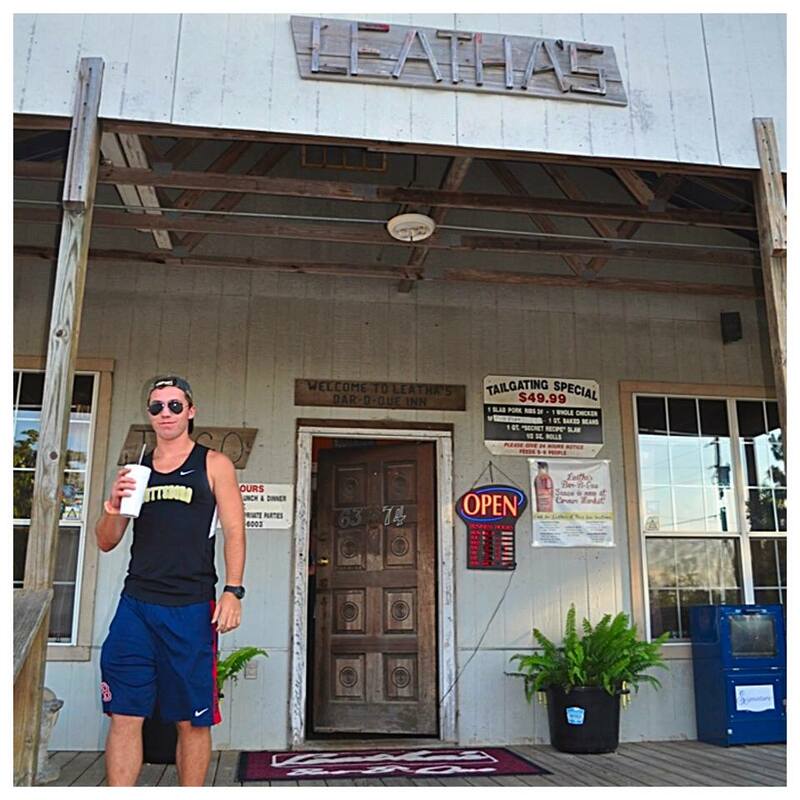 There was nothing fancy about Leatha's. The vinyl table cloths were mismatched, the floor was raw plywood, the air conditioning units were hanging on the walls, cords exposed, and the place wasn't full yet, but it was still early. We were seated at a table near the front door and our drink orders were quickly taken. We studied the menu and had our choices made by the time the server returned with our drinks. JD chose pork ribs and I got the pulled pork plate. We both had potato salad and slaw with our meals. So, what did we think about this Mississippi barbecue? It was good. JD's ribs were falling off the bone, smoky and meaty. My pulled pork was tender and plentiful and the sides made a good accompaniment, especially the mustard slaw which I happen to like. The potato salad was a little more smooth than I prefer, but it was still tasty. 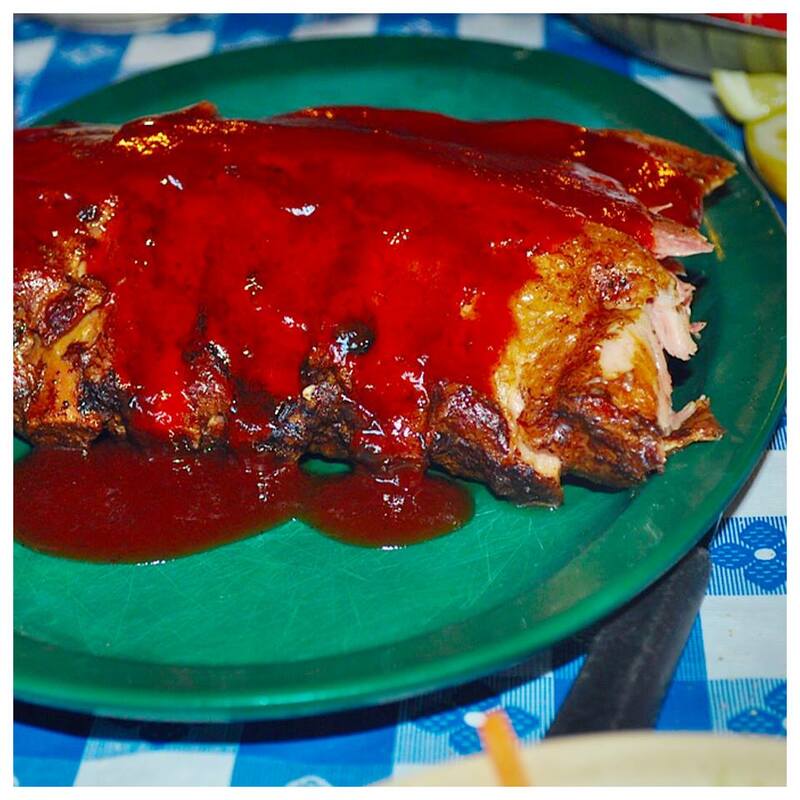 The sauce poured over my pork was too sweet and too much for me and I would have been happier without it. It was also smothering JD's ribs. 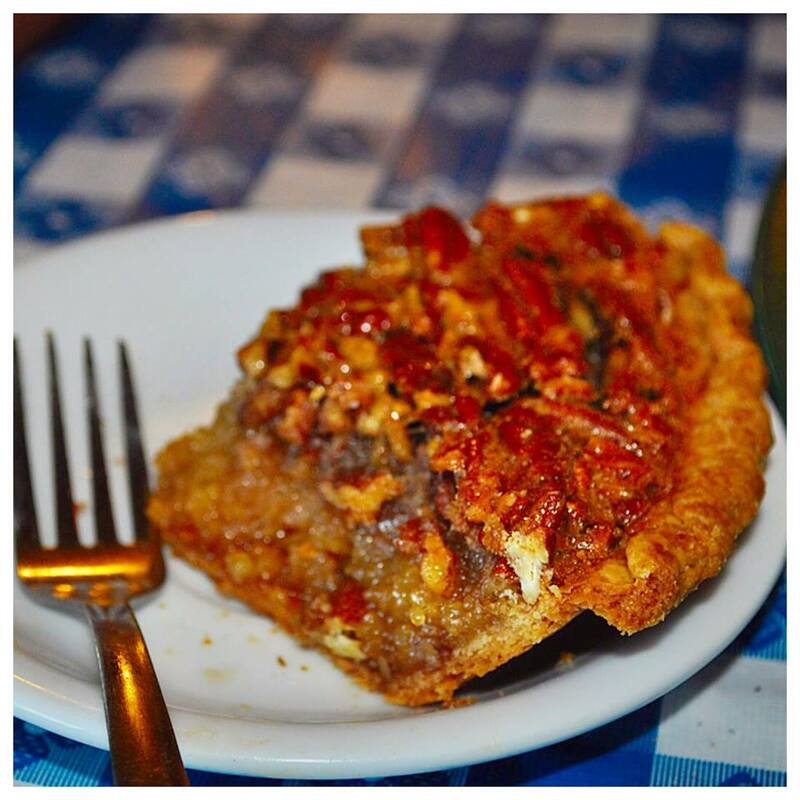 JD finished up with a piece of pecan pie. He said it was good, but since I do not care for pecan pie (I know, weird), I just took his word for that. The bottom line is, for someone who never gets barbecue, Leatha's would be a find, but those of us who have grown up with some of the most amazing barbecue in the world are a little more discerning. Growing up in Alabama, I have developed distinct preferences. I like my barbecue less wet with more of a mix of inside meat and "bark". I also prefer a vinegar based sauce over a thick sweet sauce, which is what was poured over my pork at Leatha's. JD and I both thought his ribs were better than my pulled pork, but I still would rather have ribs with a dry rub as opposed to a wet sauce. 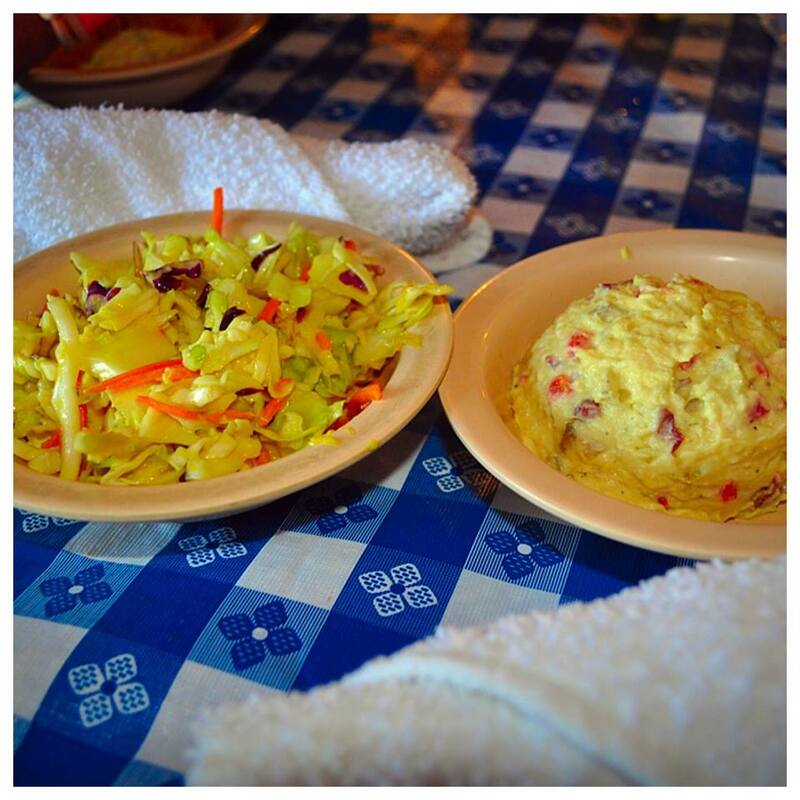 The mustard slaw was good, but it is not as good as the mustard slaw right here in Jackson County. Mud Creek and Triple R make mustard slaw that is hard to beat. I understand, barbecue is very polarizing. Everybody has an opinion about what to barbecue and how to barbecue and what to serve with barbecue. I think the best barbecue in the world is right here in Alabama and, of course, north Alabama is home to one of the best condiments in the world...Alabama White Sauce! I know most people like white sauce with their smoked chicken, but I like it on my pulled pork, too. Here in Scottsboro, KC's and Carlile's are great places for delicious smoked chicken and white sauce. 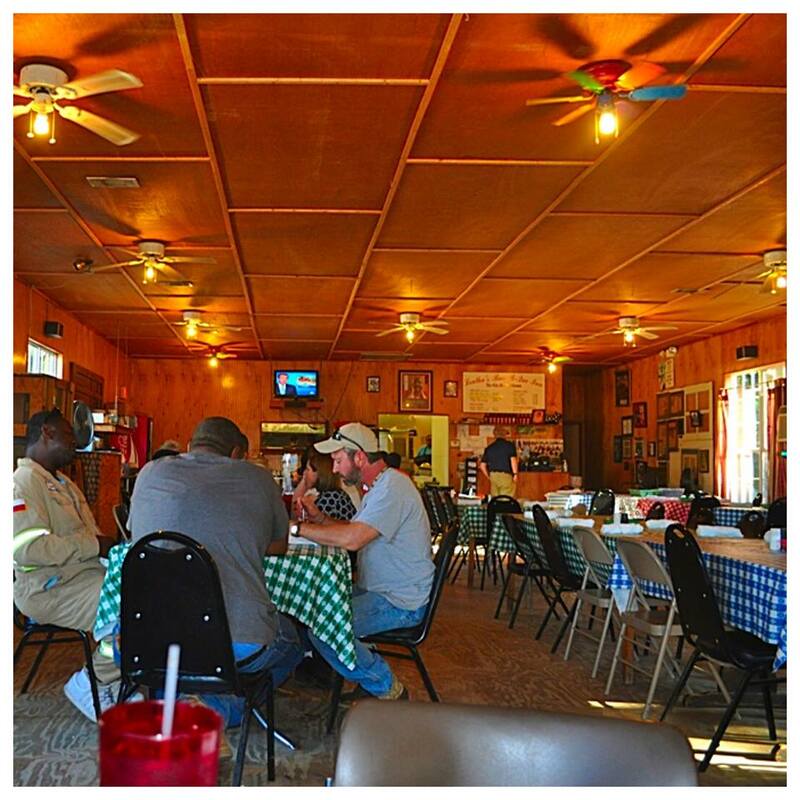 So, to sum up, Leatha's Bar-B-Que Inn in Mississippi is good, but if you are like me and have grown up with the Gibson's barbecuing in your back door and inventing that heavenly condiment, Alabama White Sauce, you might not be quite as impressed as someone else who hasn't been as fortunate. 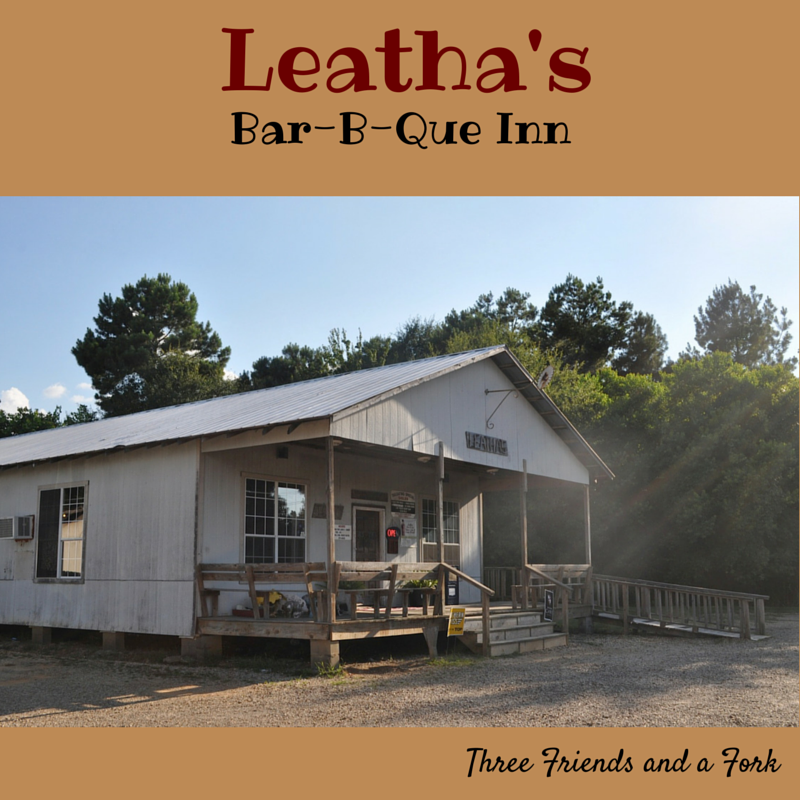 Three Friends and a Fork gives Leatha's Bar-B-Que 3 Mississippi Yums UP. But if you are in Mississippi and you can wait a bit to eat, drive on over to Alabama and help yourself to the best barbecue in the world! Now I'm hungry. Love the post.